Event is Wednesday night at Pinkerton Academy featuring local builders, information, food, games and prizes. Senior Andrew Puccilli of Derry, right, and classmates Robby Woodman of Hampstead and Cooper Richards of Derry work on a large bench during a recent CTE class at Pinkerton Academy. on a table during his CTE class Monday. 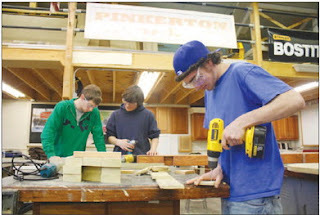 DERRY -- While Pinkerton Academy Career and Technical Education students have been busy learning the basics of home construction in the classroom, local business leaders say an awards ceremony and mini-home show tonight will help students build the relationships that will carry them into the workforce. The Home Builders association is sponsoring the 12th annual Pinkerton Night and Mini-Home Show, held tonight at Pinkerton Academy. This year’s keynote speaker is state Sen. Jim Rausch from Derry. Roger Demanche, president of the Home Builders and Remodelers Association of New Hampshire, and Jacome will also address the audience. About 70 Career and Technical Education students are expected to turn out for the event, including a handful of parents. Teachers will award a “most improved” award to one student in building construction technology, climate control technology and electrical technology programs. Members of the Home Builders association have sponsored individual students or groups of students, Jacome said. 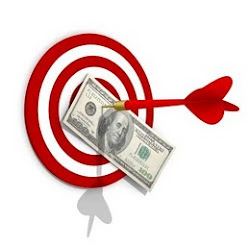 The top event sponsors are In-Laws Construction of Candia and Parkland Medical Center in Derry. About 20 local vendors will be on hand to share information about their businesses with students and families, said Jacome. There will be food, prizes and games for attendees, she said. Pinkerton CTE director Jack Grube said that networking is invaluable for students, especially those who will graduate and head straight into the workforce. And Grube said that meeting with current professionals can give positive reinforcement to students who may be facing some pressure from parents and other adults to pursue other fields. “I think there’s still a stigma in society when people say I want to be an electrician or a builder,” he said. 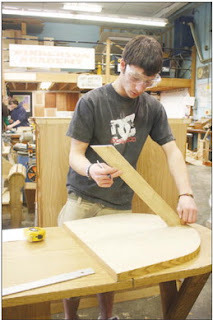 “When kids are going into the trades from parents in the trades, it’s an easy transition. But depending on what their parents’ professions are, when students come home and say they want to do this, they might get a different reaction. “When students encounter that, even if only occasionally, it’s nice to encounter an equal amount of people who are encouraging them,” Grube said. Tickets for parents are $5, and $30 for others interested in attending the event. For more information about the event, contact Lisa Bowman at info@snhhbra.